Vladimir Putin has appeared in public for the first time after 10 days of absence, quelling intense speculation about his health. 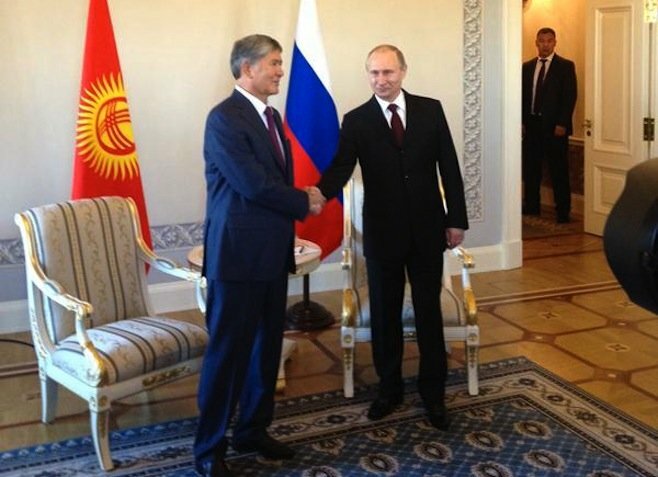 The Russian president was meeting Kyrgyzstan President Almazbek Atambayev in St Petersburg. He was last seen in public on March 5. Commenting on the rumors about his health, Vladimir Putin said: “Things would be boring without gossip,” RIA Novosti news agency reported. Earlier, Vladimir Putin ordered Russia’s navy on to a state of full combat readiness in the Arctic. Russia says the navy drills involve 56 warships, planes and 38,000 personnel. According to a tweet from the meeting in St Petersburg, Almazbek Atambayev said that Vladimir Putin “just took me for a little drive – he was at the wheel – nearby here, and I can confirm that he’s in excellent form”. The Russian TV news channel Rossiya 24 also showed some brief footage of Vladimir Putin at the meeting, without sound. Kremlin spokesman Dmitry Peskov – quoted in a Russian journalist’s tweet – said St Petersburg was chosen as a convenient venue for Almazbek Atambayev, whose daughter is studying there. Dmitry Peskov was also quoted as saying the “little drive” mentioned by the Kyrgyz leader lasted about 20 minutes, and Vladimir Putin “showed what a beautiful place Strelnya is”. Vladimir Putin and Almazbek Atambayev were meeting at a tsarist palace in Strelnya, outside St Petersburg.